“I currently live with a chronic debilitating illness. As a result of this, I am frequently home-bound and limited in my activities and physical abilities. This further increases isolation, loneliness, depression, and the daily struggles of living with a painful illness. While I have been medically advised to increase my level of physical activity, it has been challenging to do. I finally started hiking for the first time under the thoughtful planning and organization of a group hike led by Zenyu. Every detail was carefully communicated to all 14 LGBTQ participants – what to wear, eat, bring, and expect. 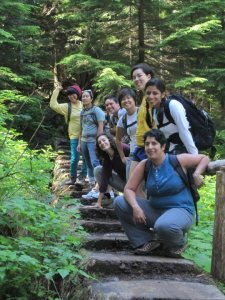 The hike was a joyous experience of being in nature with lots of people who were new to this activity or had less experience with it, and there was a great deal of support provided to each person by the organizers. We successfully completed a 7.4 mile hike to Annette Lake while soaking up sunshine, waterfalls, and the beautiful greenery all around us. An entire community of people awaits this hiking trip becoming a monthly adventure, sanctuary, and a space to deepen our connections.